So, is the idea to just keep rebooting these comic book movies until there's one that everyone — critics, the masses, the diehard fans — loves, then make three of those, and then...a few years later just reboot it all over again? Well, don't count on two more of these to come out anytime soon, but you can probably bet on another reboot within the next ten years. Poor Michael Chiklis. All this time he thought he had delivered the definitive portrayal of Thing, and here comes skinny Billy Elliot to push his Thing out of the way. So to speak. Joel Edgerton makes his directorial debut with this thriller in which he also stars. He's Gordo, known as "Gordo the Weirdo" in high school. Jason Bateman is Simon, one of the bullies who taunted Gordo way back when. But that was a long time ago, and Gordo just wants to let bygones be bygones, and try out a friendship with Simon and his wife. What began as a TV spinoff of the Wallace and Gromit series is now its own movie. And much like a certain pig who got more adventure than he planned on when venturing into the Big City, Shaun and his fellow sheep must try to blend in and avoid the law as they try to find their missing Farmer, who's lost in the city with a nasty case of amnesia. Jason Segel is getting Oscar buzz for his portrayal of author David Foster Wallace in this fact-based film based on the book Although of Course You End Up Playing Yourself by author David Lipsky, which details a five day tour/interview Lipsky, (played by Jesse Eisenberg), spent with Wallace after the publication of Infinite Jest, that book you carried around for weeks in the 90's but never actually finished. Diablo Cody wrote the script; Jonathan Demme directed; Meryl Streep and daughter Mamie Gummer play mother and daughter. Has potential, right? And yet, looks really cheesy! Has Streep finally met a character — aging rock and roller — she can't play convincingly? 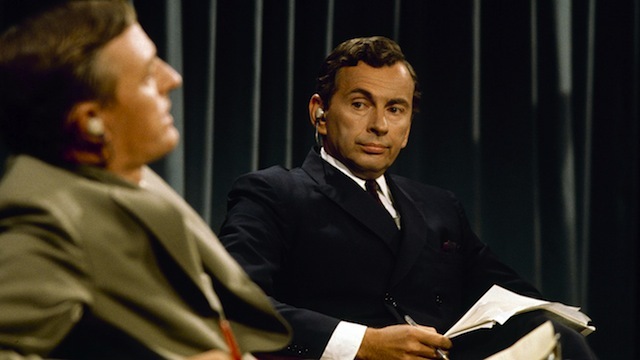 Documentary about the famous series of televised debates between Gore Vidal and William F. Buckley Jr. during the 1968 Miami Republican National Convention in Miami, and the disastrous Democratic National Convention in Chicago. Wondering how the news devolved into 24 hour cable channels featuring people screaming at each other? Well look no further than these two. Charlize Theron stars in this adaptation of a novel by Gone Girl author Gillian Flynn. Theron plays Libby, the survivor of brutal massacre that took the lives of her mother and her sister back when she was a child. Her brother was eventually convicted of the killings, and Libby, now a fucked up adult who makes a living mooching off the ghoulish true crime fans obsessed with her case, agrees to attend one of their mini-conventions, as they ponder the potential innocence of her brother. The movie's release was delayed, and now it's getting a limited theatrical run, paired with On Demand availability. None of this is a good sign. But it's enough to get me to watch just to find out what the hell went wrong with what, on paper, seems like a sure fire hit. Marlon Brando narrates this unconventional documentary that utilizes the many hours of audio tapes the actor recorded himself, recordings that included biographical stories, some ramblings, and lots of self-hypnosis meditations. This narration is paired with clips from his films, home movies, personal photographs, some mood-setting location shots, as well as an odd computer-animated version of the actor's face, which Brando himself posed for. It's an incredibly unique and also oddly hypnotic film, (even without the self-hypnosis moments).